The most popular variation of Baccarat is American version of the game that was first represented in Nevada, at casinos in the late 1950s. However, there are some variants of Baccarat played in the other countries, and all of them differ or have something in common, regardless of the fact that the goal of the game and the tips are the same. The term Baccarat in its general meaning is usually referred to American variant of the game nowadays. This variation of game has several key differences to that of American. The player usually has an option to stand or draw on 5. The banker is controlled by the dealer and has an option if to draw or not the third card. The casino provides money for the hand of the banker. 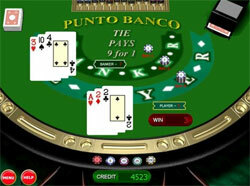 The player pronounces a word “banco!” If he is going to cover the bet of the banker. The other players cannot bet during such a round. This game is played with the rules similar to the regular game, except some deviations. The limits are lower and vary from 2 dollars to 5 dollars minimum and up to 50 dollars maximum. It is considered to be the training game for newcomers due to its relaxed pace and training ground. Mini Baccarat is missing the usual ritual of passing over the shoe box. This variation is applied at some European online playing halls or land casino with the same goals and rules, but with slight deviations. Solely the house performs action of the banker, and it is operated by casino. The wagers can be much higher, than in the case of some other player’s acting as the bank. The game can be played with one player or more. This game is preferred by the French casinos; however North America prefers promotion of Nevada Baccarat variant to Chemin de fer. The casino never plays the banker. Here the player cannot just bet player or banker, he has to be something one either Punto or Banco. The players bet among themselves, the bank only rotates. The shoe moves counterclockwise round the playing table like the train (Chemin de fer means railway in French). Casino has no immediate interference with the betting, but provides with the croupier to be sure the rules are not violated. This game is the most popular among the other variants and is eagerly played Las Vegas playing houses. The player plays against the casino. It supplies the funds for the game.